Hi guys it’s Mani, here to give you all the low down on the battles my new tau army had to endure to secure a 5th place finish at the 86 man Element Games Grand Slam. First of all I would like to say how fun and enjoyable the event was as a whole. It was run very well and the level of players was top class. I would 100% recommend this event to everyone out there who enjoys more competitive games. So the Main Part, a proper in depth look on why the list is designed the way it is. T’au Sept – T’au sept is by far the best sept for this kind of list, this is for a number of reasons including the tenet Coordinated Fire Arcs which allows your units to hit on rolls of 5 and 6 and when firing overwatch and when using the For the Greater Good ability. Darkstrider – Yet another reason for going with T’au sept, this character is key in a Fire Warrior heavy army as he allows all friendly T’au sept infantry units within 6” of himself attack with ranged weapons even if they Fell Back this turn. This means when your opponent charges they eat a whole volley of overwatch and For the Greater Good shooting, and then feel relief as they tie your Fire Warriors up. Only to find out that you can fall back and hit them with another volley of shooting at regular BS. Focussed Fire – Now this is the T’au sept specific stratagem and means as soon as a T’au sept unit from your army causes an unsaved wound on an enemy unit in the shooting phase, you can add 1 to wound rolls for any other T’au sept units from your army that target the same enemy unit this phase. This is very nice in this build as it means if used on big targets such as Imperial Knights or Superheavy Tanks your Fire warriors then wound these behemoths on rolls of 4+, and with the amount of shots 137 Fire warriors put out you are almost guaranteed to kill that 1 major threat to your army. Cadre Fireblade – These cheap little characters make your Fire warriors shoot an extra shot within half range of pulse rifles and pulse carbines, allowing them to fire 3 shots each in rapid fire range. SWEET!! They also provide a Markerlight which hits its target reliably as they have BS2+. Crisis Commanders – These guys are AMAZING! By far the best shooting in the army, wish I could take more of them. They are there to help the army deal with elite troops and tanks. Also 1 of them can declare either a Kauyon or Mont’ka once per battle which is really helpful. Ethereal Warlord – This guy is an absolute gem for 45 points. He is mostly used for his Sense of Stone aura ability which allows all infantry and battlesuit units within 6” to roll a dice when they suffer an unsaved wound, on the roll of a 6+ that wound is not lost. But his warlord trait Through Unity, Devastation is also amazing when you have so many Fire Warriors to take advantage of it. It allows you to pick an enemy unit visible to your ethereal at the start of your shooting phase, and until the end of the phase each time you roll a wound roll of 6+ against that unit with a friendly <sept> unit within 6” of your warlord, the Armour Penetration characteristic of that attack is improved by 1 (e.g. AP0 becomes AP-1). Coupled with Focussed Fire means that this ability triggers on rolls of 5 and 6 which literally is Devastating. Pathfinders – These little guys are there for some Markerlight support and also for their Pulse Accelerator Drones which allow T’au empire infantry units to increase the range of their pulse pistols, pulse carbines and pulse rifles by 6” whilst they remain within 3” of the drone. This gives your Fire warriors a massive 36” range and an 18” rapid fire range. Riptide – This big guy is there to add some flexibility to the army as he can deal with elite units and tanks from range aswell as buffing his invulnerable save to 3+ and tying up combat units. 137 Fire Warriors – For all of you who know me I absolutely love HORDES! So if I can find a combination which allows a horde to be very strong, I will always try it out. In this case it seems to me that it works really well. The reason I have so many Fire warriors is the redundancy, if you lose 50 you still have 80/90 left which will put a massive whole in your opponents army. Game 1 (Imperial Guard + Knight Castellan) – The Castellan started the game by taking out my shield drones and annihilating my warlord with a shieldbreaker missile. In my first turn I used the Focussed fire stratagem to take down a Hellhound with my Fire Warriors and killed the other 2 Hellhounds with my Riptide and Commanders. In turn 2 my Riptide got destroyed by the castellan and I lost a handful of fire warriors, so in return I took the castellan down to 3 wounds and killed a few squads of guardsmen. From this point the horde of Fire warriors took control of the board and slowly won the attrition war. Win 16-4. Game 2 (Death Guard + 2 Helverins) – This army had 3 Bloat Drones, 3 Plagueburst Crawlers, 2 Renegade Helverins, 2 Daemon Princes and some infantry. Now I feel a mistake was made during deployment, if my opponent deployed all the Drones and Crawlers and Princes on the front line and charged at me then I would have struggled to clear them all. However he deployed the drones at the front and everything else backed into a corner. This allowed me a turn to clear all 3 Drones and another turn to push forward using my Mont’ka and kill 2 of the Plagueburst crawlers all while losing only 20/30 Fire warriors. In turn 3 I killed the other Crawler and both daemon Princes along with some of the infantry which allowed me to take control of most of the board. Final result was a tabling. Guy was new to his Death Guard army and had not played Fire warrior spam before which is a bad match up for his army, so this was a very tough game for him. Win 20-0. Game 3 (T’au Mirror match) – In this game I played our very own Alex Harrison who had a very similar list to myself. This was a very first turn reliant game and as we all know, Alex never gets to go first against me lol. I got the first turn and killed 30 of his Fire warriors putting him on the back foot. In return Alex had a very good first turn killing about 45 of my Fire warriors. The swing came in my second turn where I killed another 30 fire warriors and had some insane good luck whereby 2 of my commanders managed to take down an entire Riptide even with shield drones and a 3+ invulnerable save. After this Alex had a Riptide, 2 Commanders and roughly 30 Fire warriors against my Riptide, 3 Commanders and almost 100 Fire warriors. From this point I slowly took control of the board and had higher scoring turns then Alex, and I started winning the attrition battle. Win 20-0. Game 4 (Magnus + 3 Renegade Knights) – So here I took on another fellow Team England player Nathan Roberts (my favourite ginger, but don’t tell Dan). As Nathan only has 4 big models in his army this was a bad match up for him, because that’s what my army is good against with all the combos it has. I started this game by shining a bit of my luck down and Seizing on Nathan! After this my Riptide took 12 wounds off the double Gatling cannon Knight which was the knight that was going to do the most work against me. Nathan then killed roughly 30 Fire warriors and my Pulse Accelerator drones, hampering my range of fire. In my turn 2 I took another knight down to 1 wound and pushed up the board. Nathan then killed my Riptide with Magnus and another 30 Fire warriors. Turn 3 was where everything swung, I managed to kill the 1 wound Knight and using my Focussed Fire stratagem the Fire warriors took down Magnus and started spreading out over the board. Nathans 3rd turn was short after this as he had 1 injured knight and just 1 fully operational Knight, however he still killed 15/20 Fire warriors and 1 Commander. In turn 4 my remaining 60 Fire warriors and Commanders killed the fully operational Knight and took control of 5 out of the 6 objectives, leaving Nathan with just 1 damaged Knight. Win 20-0. Game 5 (Double Shining Spear Ynnari) – This was a bad match up for my army and was going to be an uphill struggle. However Malik channelled my own luck against me and seized on me! (sad face). This allowed Malik to get the drop on me and kill about 60 Firewarriors and my Riptide turn 1, Ouch. In my turn 1 I killed a wave serpent and a Hemlock jet but could not kill the Shining spears as they had surrounded my Fire warriors in combat. In turn 2 Malik came forward with the second unit of spears and managed to kill my Commanders and leave me with 30/40 Fire warriors. In return I killed 1 unit of Shining spears and damaged the other unit. But that meant in turn 3 Maliks unit of Dark Reapers and damaged unit of Spears killed most of my Fire warriors ready for the death blow in turn 4. Sad Mani. Loss 0-20. 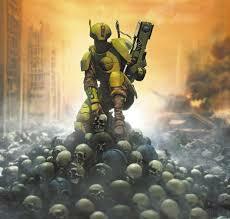 Well there you have it my lovely readers, my battle to a top 5 finish with my new Tau army. I hope you all enjoyed the article and please do get in touch with me about any feedback and queries you may have for me.